Every student will succeed. Each day, we...empower our students; inspire them to achieve; energize their passion and purpose; sharpen the focus of their vision; navigate their challenges together; encourage exploration and self-discovery. Create a community of learners. A comprehensive, regionally accredited community college in the Tennessee Board of Regents System, offering associate of arts, associate of science, and associate of applied science degrees. The College is distinguished by a diverse service area population; high market penetration; breadth of curriculum; and impact on the business-industrial-professional community of southeast Tennessee. Chattanooga State delivers its programs and services at many sites in its Service Area as well as globally via distance learning technologies. 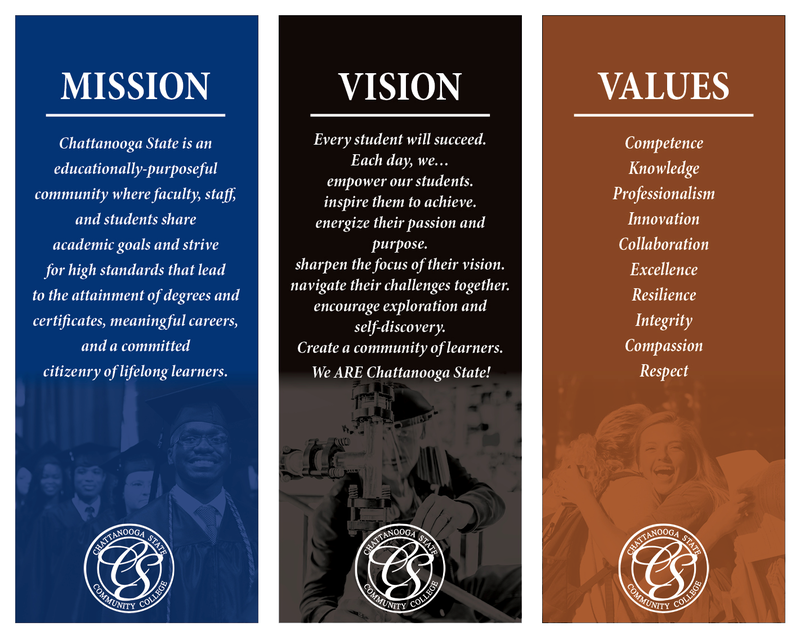 Chattanooga State maintains national accreditation in all its eligible programs. The institution is accredited by the Southern Association of Colleges and Schools Commission on Colleges (SACSCOC).